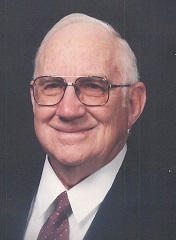 Roy Daniel George Windhorst, Sr., age 97 years old, passed away January 9, 2019 while a resident of Parkview Haven, Deshler, NE. Roy was the son of Henry J. and Verbina (Hofts) Windhorst born February 24, 1921 on a farm southwest of Deshler. Roy was baptized at St. Paul Lutheran Church, northwest of Deshler, by Rev. Lehman. His baptism verse was 2 Thess. 3:16. This fervent child of the Lord was confirmed in his faith September 2, 1934 at St. Paul Lutheran Church by Rev. G.A. Spring. His confirmation verse was Hebrews 12:2. Roy attended Ryber country school through the eighth grade. He graduated from Deshler High School in 1938 and then went to Wichita, KS for welding school. On August 31, 1941, “Red” (Roy) was united in marriage to Jennie Oeltjen. The couple began their married life in Wichita, KS where Red worked at Beech Aircraft Company. To this union three children were born, Jeanette, Roy Jr., and Georgia D. Roy was drafted in 1944 into the US Navy and served aboard air craft carriers during that time. The family moved back to Deshler while Roy served. Upon his return, the couple started farming near Ruskin and Davenport until they moved to the “Behring” farm southwest of Deshler where they resided until their retirement. Roy and Jennie then moved to their residence on Alice Street in Deshler. Roy was a member of St. Peter Lutheran Church serving in many positions. He served as Elder, President, Trustee, Cemetery Board member, Sunday school teacher, choir member and Lutheran School Board member. Red was also a member of the Lutheran Laymen’s League and a member of American Legion Post 352. In the off-season after harvest, he worked as a carpenter, electrician and welder. During his retirement years, Roy drove the school bus for Deshler Public Schools. He delighted in seeing the youngsters mature through the years. He was lavished with many a baked good at Christmas-time. Red and Jennie enjoyed their time with family which included attending many school activities for their children, grandchildren, and great grandchildren. Red and Jennie took many vacation trips around the United States and enjoyed camping and fishing locally at Lovewell Lake. Roy loved Husker football. He and Jennie attended many home and away games. As a young man, he participated in football, basketball and track. He played baseball in the summer with the Deshler town team. In his later years, Red could be found at the Hebron Golf Course. He was very proud to have made a hole-in-one when he was 70 years old. But most of all, he cherished his dear wife, Jennie and the shared faith they had in their Lord and Savior. Red is preceded in death by his parents, Henry and “Beana” Windhorst; his beloved wife Jennie; sisters Esther Lipker and Frieda Anderson, brothers Ervin, Eldon, and infant Elmer; brothers-in-law Elmer Lipker, Harold Anderson, Rudolf Oeltjen, Oscar Oeltjen and Edwin “Bud” Oeltjen; sisters-in-law Dorothy Worm, Agnes Windhorst, Luella Windhorst, Phyllis Oeltjen, and Maxine Oeltjen. This remarkable man leaves to morn his passing his children Jeanette (Robert) Harms, Hebron, NE; Roy Jr. (Margaret “Peggy”) Windhorst, Clinton, WI; Georgia (Ken) Molacek, Fremont, NE; grandchildren Rhonda Vizner, Wichita, KS; Jeanell (Gill) Mumm, Chester, NE; Ryan (Andrea) Harms, Concordia, KS; Eric Windhorst, Portland, OR; Nina (Craig) Harmes, DeForest, WI; Terri (Nolan) Higgins, Lincoln, NE; Amy (Tom) Thorpe, Lincoln, NE; great grandchildren Brock, Colton, Cody, Tashia, Owen, Ian, Keenan, Taya, Jacob and Elise, one sister-in-law Arlis Oeltjen and many nieces and nephews. This faithful keeper-of-the-soil and keeper-of–the-faith now rests in peace with his Lord. In lieu of flowers, the family suggests memorials to the Roy D. Windhorst, Sr. Memorial Fund.